The Salt Bath aspect of heat treatment may be applied as a part of the overall process, or applied as a complete treatment in its own right. 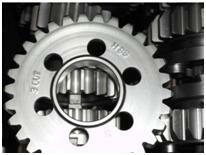 The process delivers hardened metal casings. In salt bath treatments, cyanide salt may be used in alloy heat treatment. The process may also be used as a part of liquid Nitriding treatment. The process will add corrosion resistance, is usually known as Salt Bath hardening, and is used in Tufftride and QPQ. Salt bath treatment is an alternative to Durferrit (an adjunct to carburizing). It is also an alternative to Sursulf (an adjunct to induction hardening). It is also an alternative to Corridur (an adjunct to flame hardening). The output of the process is surface hardening of the alloy or other metal material. The Tufftride process of Durferrit is a Salt Bath Nitrocarburising treatment carried out at around 580°C for relatively short times (30 minutes to 3 hours) which produces a hard wear resistant surface on many steels. It is common to oxidise the surface compound layer formed, by using the oxidising AB1 salt bath. Corrosion resistance of the steel is enhanced by formation of this surface layer in a similar way to many other Nitrocarburising treatments. Fatigue strength and indentation resistance is superior to untreated steel due to a diffusion layer beneath the compound layer. The depth of this diffusion layer depends on time of the Tufftride® treatment and the type of steel being treated. This treatment is used as an alternative to chrome or nickel plating. QPQ® is the name given to the Quench, Polish, Quench treatment of Tufftride®. As the name implies, parts are quenched after Tufftriding, polished to restore the surface finish (surfaces are roughened during the Tufftride® process) then reoxidised in the oxidising salt bath. Due to the improvement in surface finish, QPQ® provides enhanced corrosion resistance over straightforward Tufftriding along with reduced friction coefficient. If choosing a Tufftriding treatment, consideration must be given to component geometry, particularly blind threaded holes. Please contact the Hauck HT Letchworth site for further detail on Tufftriding.